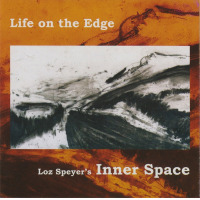 Trumpeter Loz Speyer leads his British quintet through a multifaceted progressive jazz exposition during these eleven compact and concisely stated works. You won't detect any filler materials or over-extended improvisational jaunts on this superb outing, that effectively highlights the leader's jarring and perceptively constructed compositions. Leo Records proprietor Leo Feigin provides some insight into the band's chemistry stating that, "Ever since the end of the '60s and the timeless recordings by the Art Ensemble of Chicago, I have been looking for a band with the same kind of aestheticsdeep emotions, subtlety, simplicity, weightless swing." On the other hand, I detect similarities to some of those classic Blue Note or Prestige hard bop recordings amid the frontline's 3-way dialogues, generated atop bustling primary themes and tangible melodic output, including intermittent surprises here and there. The musicians traverse many musical vistas with slicky executed reverse-engineering processes, foot-stomping jazz grooves and largely, memorable thematic sojournsall enacted with chutzpah and vivacious soloing escapades. It's partly about shifting tides and by no means static. On "Space Music." Speyer's weaving trumpet notes outline a frothy mid-tempo motif, followed by the hornists' bold statements, incited by alto saxophonist Chris Biscoe's wily and forceful soloing. Yet "Deep Sea Spirit," is a semi-free piece, roughed up by Olie Brice's creaky bowed-bass phrasings, as the quintet gradually ups the ante via a rather inquisitive storyline. "Contretemps" features an up-tempo jazz waltz pulse, designed with a top-down mode of constructing the primary theme, augmented by feisty horns and meticulously structured choruses and loosely articulated reconstruction efforts. Ultimately, Speyer and associates hit the mark on several fronts, which lends itself well for repeated listens to coincide with the high level of excitement they dish out on a per-track basis. Track Listing: Long Road; Rocket Science; Space Music; From A To B To Infinity; Fragile; Unfold Enfold; Thick And Thin; Deep Sea Spirit; Snakes And Ladders; Contretemps; Brewglass. Personnel: Loz Speyer's INNER SPACE: Loz Speyer - trumpet, flugelhorn; Chris Biscoe - alto saxophone, alto clarinet; Rachel Musson - tenor and soprano saxophone; Olie Brice - double bass; Gary Willcox - drums.